The LHC particle accelerator in Cern starts operations this month again. Fittingly, GameArt Studio, the developer from Berlin announced the beginning of the closed beta of their new project „Fermi's Path“. As scientists search for new particles, players take over the role of a subatomic particle called Fermi on its voyage over an energetic path. In ever faster levels, driven by the beats of the music, players have to avoid many obstacles and destroy incoming particles to break the top score. The Closed Beta phase, in which selected beta tester can try out and test the game, has now begun. The game will be released on Steam. Already now, on the Steam Coming Soon page of Fermi's Path, players can get a first impression of the game and add it to their wishlist (http://store.steampowered.com/app/342650). GameArt Studio GmbH was founded 2006 in Berlin, Germany, and quickly advanced to one of the most innovative developers and publishers of online games. With its four free2Play multiplayer games Holy War, Tagoria, A.I. War and Glory Wars, which are available worldwide in 11 languages, GameArt Studio thrills a worldwide community. Since one year GameArt Studio is breaking new grounds: The action-packed future racer Quantum Rush: Champions is available since 2014 on Steam and can be played in German, English, French, Spanish and Italian. 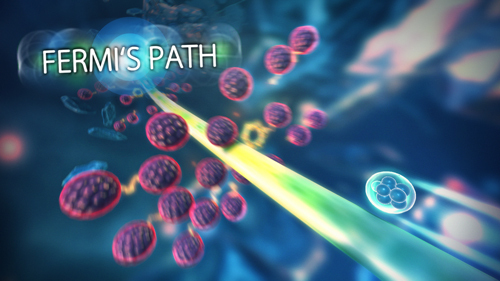 The latest game Fermi's Path is still in development and is designed as a classic arcade game. The game will also be available on Steam. The player jumps into the role of Fermi, a particle on an thrilling voyage through subatomic space. Next to many exciting levels and an infinity mode a level editor will also be included in the game.